It’s worth going back every so often to see how projections made back in the day are shaping up. As we get to the end of another year, we can update all of the graphs of annual means with another single datapoint. Statistically this isn’t hugely important, but people seem interested, so why not? For example, here is an update of the graph showing the annual mean anomalies from the IPCC AR4 models plotted against the surface temperature records from the HadCRUT3v and GISTEMP products (it really doesn’t matter which). Everything has been baselined to 1980-1999 (as in the 2007 IPCC report) and the envelope in grey encloses 95% of the model runs. The 2009 number is the Jan-Nov average. As you can see, now that we have come out of the recent La Niña-induced slump, temperatures are back in the middle of the model estimates. If the current El Niño event continues into the spring, we can expect 2010 to be warmer still. But note, as always, that short term (15 years or less) trends are not usefully predictable as a function of the forcings. It’s worth pointing out as well, that the AR4 model simulations are an ‘ensemble of opportunity’ and vary substantially among themselves with the forcings imposed, the magnitude of the internal variability and of course, the sensitivity. Thus while they do span a large range of possible situations, the average of these simulations is not ‘truth’. There is a claim doing the rounds that ‘no model’ can explain the recent variations in global mean temperature (George Will made the claim last month for instance). Of course, taken absolutely literally this must be true. No climate model simulation can match the exact timing of the internal variability in the climate years later. But something more is being implied, specifically, that no model produced any realisation of the internal variability that gave short term trends similar to what we’ve seen. And that is simply not true. We can break it down a little more clearly. The trend in the annual mean HadCRUT3v data from 1998-2009 (assuming the year-to-date is a good estimate of the eventual value) is 0.06+/-0.14 ºC/dec (note this is positive!). If you want a negative (albeit non-significant) trend, then you could pick 2002-2009 in the GISTEMP record which is -0.04+/-0.23 ºC/dec. The range of trends in the model simulations for these two time periods are [-0.08,0.51] and [-0.14, 0.55], and in each case there are multiple model runs that have a lower trend than observed (5 simulations in both cases). Thus ‘a model’ did show a trend consistent with the current ‘pause’. However, that these models showed it, is just coincidence and one shouldn’t assume that these models are better than the others. Had the real world ‘pause’ happened at another time, different models would have had the closest match. Another figure worth updating is the comparison of the ocean heat content (OHC) changes in the models compared to the latest data from NODC. Unfortunately, I don’t have the post-2003 model output handy, but the comparison between the 3-monthly data (to the end of Sep) and annual data versus the model output is still useful. Update (May 2012): The graph has been corrected for a scaling error in the model output. Unfortunately, I don’t have a copy of the observational data exactly as it was at the time the original figure was made, and so the corrected version uses only the annual data from a slightly earlier point. The original figure is still available here. (Note, that I’m not quite sure how this comparison should be baselined. The models are simply the difference from the control, while the observations are ‘as is’ from NOAA). I have linearly extended the ensemble mean model values for the post 2003 period (using a regression from 1993-2002) to get a rough sense of where those runs could have gone. And finally, let’s revisit the oldest GCM projection of all, Hansen et al (1988). The Scenario B in that paper is running a little high compared with the actual forcings growth (by about 10%), and the old GISS model had a climate sensitivity that was a little higher (4.2ºC for a doubling of CO2) than the current best estimate (~3ºC). The trends are probably most useful to think about, and for the period 1984 to 2009 (the 1984 date chosen because that is when these projections started), scenario B has a trend of 0.26+/-0.05 ºC/dec (95% uncertainties, no correction for auto-correlation). For the GISTEMP and HadCRUT3 data (assuming that the 2009 estimate is ok), the trends are 0.19+/-0.05 ºC/dec (note that the GISTEMP met-station index has 0.21+/-0.06 ºC/dec). Corrections for auto-correlation would make the uncertainties larger, but as it stands, the difference between the trends is just about significant. Thus, it seems that the Hansen et al ‘B’ projection is likely running a little warm compared to the real world, but assuming (a little recklessly) that the 26 yr trend scales linearly with the sensitivity and the forcing, we could use this mismatch to estimate a sensitivity for the real world. That would give us 4.2/(0.26*0.9) * 0.19=~ 3.4 ºC. Of course, the error bars are quite large (I estimate about +/-1ºC due to uncertainty in the true underlying trends and the true forcings), but it’s interesting to note that the best estimate sensitivity deduced from this projection, is very close to what we think in any case. For reference, the trends in the AR4 models for the same period have a range 0.21+/-0.16 ºC/dec (95%). Note too, that the Hansen et al projection had very clear skill compared to a null hypothesis of no further warming. The sharp-eyed among you might notice a couple of differences between the variance in the AR4 models in the first graph, and the Hansen et al model in the last. This is a real feature. The model used in the mid-1980s had a very simple representation of the ocean – it simply allowed the temperatures in the mixed layer to change based on the changing the fluxes at the surface. It did not contain any dynamic ocean variability – no El Niño events, no Atlantic multidecadal variability etc. and thus the variance from year to year was less than one would expect. Models today have dynamic ocean components and more ocean variability of various sorts, and I think that is clearly closer to reality than the 1980s vintage models, but the large variation in simulated variability still implies that there is some way to go. So to conclude, despite the fact these are relatively crude metrics against which to judge the models, and there is a substantial degree of unforced variability, the matches to observations are still pretty good, and we are getting to the point where a better winnowing of models dependent on their skill may soon be possible. But more on that in the New Year. That’s one (the only?) of the amusing aspects of the CRU thing. A lot of contrarian theorizing depends on these records, often referring to variations rather minute compared to the more gross effects preoccupying mainstream scientists. There’s a lot that going around. On the one hand you’ve got the conspiracy nuts complaining about “science for tenure” and “grant gobbling” rackets. On the other you’ve got people using various weird integrations of the same supposedly corrupt data, relying on minutia to explain away obviously more powerful and less noise-sensitive conclusions. Coherence was never their strength. I don’t know if one could find actual cases of mutual exclusivity as legs propping up the teetering stool of doubt but at least in terms of unlikely coincidences and juxatapositions we’re not looking at stable furniture. “Hey, at least Tilo thinks that the CRU data is right: it has 98 as the hottest single year. Completely, the best thing to do if you want to know what I think is to ask me. First, regarding the CRU data, it was the proxy data that was manipulated. I don’t see evidence of the surface temp being manipulated. There are complaints in the code about the slopiness and inconsistency of the data. But I don’t remember seeing anything that would make the surface temp data flat out wrong. Doesn’t mean that there isn’t – but I don’t know of any evidence at this point. In any case, my reason for trusting HadCrut3 is that it agrees reasonably well with the satellite data. If it didn’t, I wouldn’t trust it. Regarding the .2C per decade, I’m sure that you can do the math to get .24C in 12 years. And Don Shor gave you the quote. Yes, yes, I know that it does not mean that every decade will show the same rise. But in the absence of any known elements of natural variation that can keep it from getting that .24C, I expect to see the .24C. If it isn’t there, we should be able to explain why. Isn’t that exactly the point that Trenberth makes in one of his recent papers. I’m not comparing decades. Do you understand the difference? I know that temperatures were rising in the 90s. See #784. Is that as a result of simulating elements of natural variability or is it as a result of injecting noise that is thought to be like natural variability. If it is simulating elements of natural variability, then what natural variability are the models simulating. And since the decade is already in the books, did we observe those elements of natural variability operating? Gavin, didn’t you say that should be the last post on this subject? Would it be unnecessarily hostile of me to recommend that TR be kicked the heck off RealClimate until he agrees to talk about something else? This is wasting dozens of posts, edging up toward the hundreds, simply because he refuses to admit reality. TR is still confusing noise and forcings, eh? Tilo Reber has a thread of his own at Deltoid. But what dittos denying AGW ***have*** claimed is that the IPCC predicted continuous linear increasing temperatures. Then when this doesn’t turn up, say that the IPCC prediction of same (which they didn’t) shows they’re wrong. But in the absence of any known elements of natural variation that can keep it from getting that .24C, I expect to see the .24C. So now natural variation is no longer occurring? What are you smoking these days? Willful ignorance has no value. While it is important to refute silliness and stupidity, the repeated spinning and ignorance of Tilo proving to the planet that he is incapable of learning is more boring than educational for RC readers. Maybe he is pushing people so he can get the RC badge of dishonor and say we are mean and rude? Though I can’t think of anything more rude than a petulant child that refuses learn out of spite or willful foolishness, or is compensated in some form for being the class clown. Do you have copes of all your grocery shopping lists handy from 2003. I would very much like to do a stochastic analysis and compare that to HADCRUT3 data to see if any discernible patterns appear in your spending and grocery choices that I can use to prove that human caused global warming is not occurring. I mean, you must have all the time in the world to go fetch any request I have, right? I mean, you don’t have any other responsibilities or duties, right? I mean, you are at my beckon call to go get or spend the next three weeks retrieving any piece or pieces of data I request from you personally, right? Another, lame question… how inappropriate. No wonder these phantoms don’t post their last names. 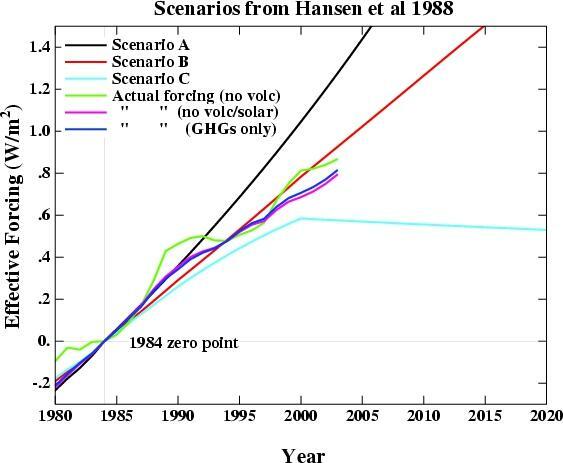 Well if Hanson’s “scenario B” was supposed to be ‘plausible’then the rest of his predictions are not worth betting on.There is a .3 degree celcius difference between ‘B’ and observations as of the latest data.With that kind of discrepancy for 25 years,that means 1.2 degrees celcius error in ‘B’ per century! The only conclusion one can draw is that the model has poor predictive value. No worries Tenney. I think it is apropos to attack the argument and the method and even the mentality and premise from which it derives. Sometimes, when a pattern is sufficiently proven even the integrity or degree, or lack thereof, of honor displayed in such naive nuanced tones and hues. I do fight fire with fire but to quote an old movie with Sean Connery, “leave it to a wop to bring a knife to a gunfight”. I’m half Italian actually and 1/4 Irish with a mix of Russian, but to paraphrase, I tend toward the Powell doctrine. In other words. If someone tosses hot coals out as straw-man arguments, red herrings or non sequiturs, or even mere sparks to appear subtle, I will come back with a flame thrower if I have one and it is the right tool in such instance. If I recall properly, I did come down on you a bit, but with respect, because I know you are well intended and as concerned as the rest of us. I was merely concerned that you were coming down a bit hard on the scientists. As I said then, I understand your frustration, many of us share it, but I can’t attack the source of the profoundly important work of the scientists that understand the connections and contexts. My experience is they are all hard working and dedicated to laying the foundation of science that we have the right material to combat the denial of well understood and founded science. And as I said then, please don’t get me wrong, because I do appreciate the spirit and the fight you have within you for this most important cause. Maybe he ought to read Tilo’s posts. If you correct only for volcanic forcing and ENSO, we go from an anomaly of about 0 in 1975 to about 0.6 in the latter half of this decade. I make that pretty close to 0.2 degrees per decade. Now I know you won’t like this Tilo, because it’s GISTEMP, but HADCRUT will likely be fairly close to 0.2 as well. And Tilo, rather than having Don go do your work for you, why don’t you read Gavin’s tutorial FAQ on models–or are you afraid you might learn something? Did anyone predict, decades ago, the degree of ice melt we’re seeing from glaciers, ice sheets, ice caps etc. all over the world from the relatively small amount of global warming we’ve seen to date? We always seem to be reading that effects are exceeding expectations in ice melt and other climate responses and it would be interesting to know if any climate scientists were unusually prescient about such effects. 802 Tilo Reber Yes, yes, I know that it does not mean that every decade will show the same rise. But in the absence of any known elements of natural variation that can keep it from getting that .24C, I expect to see the .24C. It seems to me that your first sentence cancels out your second sentence. (1) the change in global temperature since 1998 is positive; i.e., increasing? (2) the rise in global temperature since 1998 is within the range of model outcomes cited in IPCC 2007? Don Shor (816), This is a fool’s errand, none-the-less I’ll try Tilo’s answer: the change in global temperature since 1998 is negative, not positive. If you would have started in, say, 1980 or even 1997 or any year in between (years after 1998 are a mixed bag) your statement would have been accurate — positive. However, that’s not a trend, Rod. Completely Fed Up, but that wasn’t the question. How hard would it be for somebody to just dig up Hansen’s old model and run it again, using the actual observed forcings? I understand that Scenario B is quite close to the actual forcings, but using the actual forcings should remove the question of which scenario was most relevant. Also I always wondered why that paper didn’t give an ensemble mean with an envelope, as is now common. Without the envelope, it’s hard to judge the model results. What am I missing? I’m late to this one, so sorry if the question was already asked amid the 800 previous comments. Maybe this has already been covered before, but please do respond. I am in no way, what you would call a denier. I just think I see something here that might need correcting. Therefore, I have some questions about about the Hansen (1988) predictions: Sure, they are old and some would argue irrelevant. Still, I think it’s an interesting narrative to re look at the older predictions (seems to me the older the prediction the more likely any errors are to reveal themselves. Newer models, yes, are likely to be better – but have not had the time so see how good they are). Anyway, you say that senario B is running a little hot. As I understood it the senarios were based on CO2 emission levels. From the orig. paper, shown below, it say that Senario A was with the same continued rate of C02 emissions (1.5% annually). Senario B was with decrease growth rates, and senario C with ‘drastically’ decreasing growth. As I understand it, globally, we actually went over that 1.5% significantly. I couldn’t find the global emission percentage growth but I assume that the rate has actually increased (correct me if I am wrong). Therefore, to compare predictive power of the model don’t you need to go back to the model, plug in the emissions, get the output number and then compare this to observations? Alternative to being able to do this, are you not forced to choose the senario that is, at least, most similar (being senario A?). So my question is, how do you justify choosing senario B for the comparison? Then what was the question, Rod B? When you’re talking about cooling in a climate website, you don’t mean “it is colder now than some other point” because that’s nothing to do with climate. If you want to talk weather, you can go to your national met service and see if they have info on the weather for you. Tristan, Hansen’s model assumes a significantly higher CO2 sensitivity than do current models. That alone probably is sufficient to explain why it is running hot. Completely Fed Up, wasn’t my question; go clarify with the questioner. I was just answering the question that was asked. You must be answering an imaginary question. There is any oficial site where this proyections of the IPCC AR4 models, as in the first figure, are accesible? I had not success locating this metetada (and the envelope). I think they can be used to show anyone wheter this simulations holds with measured temperatures or not. can anyone help? Maybe the same thing as I’d miss if I asked “Why didn’t cars in the early 1900’s use seatbelts as is now common?”. Computing power has gone up a lot. Ensembles are a new thing because you need a lot of computing for it. And you still don’t show three different scenarios with an ensemble unless you triple up all the model calculations and the graphing data. Somehow, I’d prefer to go straight to Easterling & Webner. Long ago; it’s been published, and discussed here at length previously. Citation: Easterling, D. R., and M. F. Wehner (2009), Is the climate warming or cooling?, Geophys. Res. Lett., 36, L08706, doi:10.1029/2009GL037810. In detail and with zero comprehension I might add. I gave you the link. Of course I expect the personal attacks from people on this forum. Too bad that’s all you’ve got. Considering it’s obvious faults, I’m surprised they published it. So RC went back to the well with GISS. And we are to believe that while 80% of the earth had no warming, the poles warmed so much that they continued the trend for the entire globe all by themselves. And while there was no significant divergence of GISS in the 70s, 80s, and 90s, even though they used the poles then, that suddenly in the 00s, the poles alone made all the difference. Well, thanks guys. Having heard your critical review – the usual smears with no substance – I now feel even better about the correctness of the blog. Of course you do, Tilo. You’re very much a “true believer” in the Eric Hoffer sense. Nope, saying you did no detail and there was no appearance of comprehension in the answer is not an ad hom. Typing in tripe seems to be all you’ve got, Tilo. (PS if we were to look on your website, we’d see very little BUT ad homs, especially by your definition of it, given what you have to set it to to match Hank’s comment). Obvious faults with what? What faults? Nope, you’re to believe the AGW science that says that though CO2 is the greatest contributor to the change in global temperatures seen over the last 150 years, it is not the only component. Most are short-lived and do not undo the change wrought by CO2. See, that would, by your lights, be an ad-hom. I guess that since you think this means you have nothing else, you have nothing except ad-homs to your posts. I feel better about the comments on your posting history. Nope. You mentioned that the paper had been submitted; you omitted the fact that it was published months ago, and pointed to a copy rather than citing the publication. 1) simple basic beginner step: cite the source. 2) next step: don’t state your conclusion as an assumption. 3) third step: show your work. 4) fourth step: the psychological analysis is Blog Science, but don’t try to get it into a journal. 6) submit your work to a legitimate journal. 7) in the end, try E’n’E. “Their paper has been submitted to Geophysical Research Letters for publication. Well, since you don’t consider it a personal attack, I guess I can say -apparently you read the blog with zero comprehension. I say this as a summation in the blog. And each item is explained further in the blog. A. The current 12 year flat period is longer than their 9 year examples. B. The current 12 year flat trend has less trend than their 9 year examples. C. The current 12 year flat trend is not an ENSO artifact like one of their 9 year examples. D. The current 12 year flat trend is not a volcano artifact like the other of their 9 year examples. E. The current 12 year flat trend is open ended, whereas their 9 year trends are ended. And those are just part of the problems with their paper. There is more discussion of other problems as well. Yeah, those HadCrut3v temp charts are just adhoms. The Trenberth quote is an adhom. The analysis of how their examples are ENSO artifacts and volcano artifacts are adhoms. So your answer to a very specific point and a very specific objection is to wave your hands and say, “have faith”. The link that I addressed is the link that someone gave me when they wanted to make the 98 cherry picking point. I really don’t care if it was published or not. The arguments in it are the same arguments that you see here as well as on many other AGW sites. My main objective was to answer the paper and answer those points. Publication or non-publication doesn’t change that. If I had thought that it made any difference I would have found out if it was published. I have no desire to get published in the journals. If your point is that blogs are useless, then what is the purpose of RC and what are you doing here? What do you think I was doing when I charted their sample time periods and showed that they were ENSO and volcano artifacts. And what was I doing when I charted the current time period and showed that it was not an ENSO or volcano artifact. So, does Tilo remind anyone else of the Dark Knight from Monty Python and the Holy Grail? The “current flat trend” only shows up of you choose 1998 as your starting point. Try it with your starting point in 1999 or 1997 or any other year and it doesn’t work! Gee, what was special about 1998. Hmm, it was a very strong El Nino AND it was the tail end of solar max. Gee, now why would an honest person cherrypick such a year as his starting point? Any ideas, Tilo? Are you really that deluded or are do you just lie like a rug? The climate is 30 years. The data doesn’t show a flat trend. Where do you pull these from? Therefore you are not right, but if you wait another 18 years you can find out if you are. So your response as to the flaws is that when they pick a 9 year trend they’re wrong, but when you pick a 12 year trend it’s right because..? Flailing like a stranded fish is not showing your case, it’s showing you have nothing on under the kimono. And we’d rather not see it. We all thought (and seems we’re right) that you were trying not to prove you right, but everyone else wrong. Your 12 year period is wrong. It was an 11 year period a year ago. It was a 10 year period 2 years ago. It is based on a cherry pick. 2005 is the warmest. Yet your continued use of the 1998 year shows that you consider the CRU data to be authoritative. > I really don’t care if it was published or not. Citing helps people to check citing papers to find errata, comments, and other papers. You don’t care to help your readers find that material? Why is this dead horse still thrashing around? No, climate models cannot predict the exact little short-term wiggles in the temperature record. They predict wiggles, but they aren’t in phase with the actual ones. And yes, even in hindsight, it isn’t easy to give full physical descriptions of the short-term wiggles that do occur. Yes, it’d be good if this could be done. Hence, Trenberth. So if the noise is what interests you, well then, the noise is interesting. But if what you’re interested in is the long term behavior, the noise is within what you’d expect using the models, so there is nothing surprising there. There could be global warming for the next 50 years, and the likes of the current sceptics would still be able to find some intervals and data sets where they could draw a flat trendline. 2040-2050 could be warmer than 2020-2030, and that warmer than 2000-2010, which we know is warmer than the preceding decade, and they’d still say there was no warming. If they hunt through the 1980s, they could do the same back there, too. What’s the point? How long must we rebunk? The “current flat trend” only shows up of you choose 1998 as your starting point. Try it with your starting point in 1999 or 1997 or any other year and it doesn’t work! Thanks, Ray, at least we are now getting to the meat. I address the 98 issue very clearly in the blog. I’ll give you a quick overview. But it would have been better to read the blog so that I don’t have to write the same thing over and over. Besides, the backing charts are in the blog. 1. The issue around using 98, 99, or 00 is an ENSO issue. 98 was a La Nina, 99 and 2000 were El Ninos. Pick any of them as a starting point and you get an ENSO bias. So if you want to know what the answer is if you don’t get an ENSO bias, look at the ENSO corrected data. The ENSO corrected data is flat. 2. If you use non ENSO corrected data, then what year gives you a trend line that looks the most like the ENSO corrected data. Answer – 98. Reason – the effect on the slope of the trend of the 98 El Nino and the 99-00 La Nina cancel each other out. Look at the 12 year satellite chart that I link in that blog. It shows you when all of the ENSO periods are at the top. It doesn’t give you the strength of the event, and the 98 El Nino was very strong, but the 99 and 00 La Nina was very long. Also, when you look at that ENSO corrected chart, look at how much that 98 La Nina is chopped down. And yet the trend is still flat. Oh, I don’t want to leave out your 97 suggestion. My statement is that we have a 12 year flat trend from 98 to the present. My statement is not that we have a 13 year flat trend from 97 to the present. I’m well aware that temperatures were rising in the 80 and the 90’s up to 98. No point disputing what is not under dispute. It’s interesting how you love to throw out such an accusation without ever considering that I might know and understand your points and without having read where I answered your points.